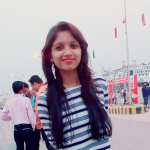 Hi, I am Nayantika persuing a Bachelor's degree in Biotechnology from Shri Ramswaroop Memorial university , Lucknow . I am a voracious reader and also love to travel , I have travelled across different cities of India only ..and hoping to visit different countries around the world . I dig up interesting and unique topics from different domains and share it's content with all my readers through my blogs .
" Is hookah really as bad as cigarettes??" "Quinoa : Supergrain for future"
Real life do not have happy endings.. Acceptance to reality…Is it right?